Thunder Reels slots online is inspired by the 80s arcade scene that brought you some of the most scintillating online slot games and fruit machines of the decade. 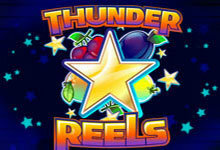 Thunder Reels is a three reel neon classic featuring simplistic fruit symbols that you would have seen before across other slots, and also a sharp lightning theme that lays dormant in the background. Spin today to earn your fortune. Playson is a leading gaming company that currently offer 40+ online games with many more to come this year. It has headquarters in Malta and works with many platform providers including GamingTech and Leander. They design and develop customised slot games to suit each players needs and requirements. Playson have over 250 staff that all strive to ensure games and developed to provide the best gaming experience possible. All games are built with advanced HD graphics and new technology, so they are a cut above the rest. Look here for a list of our slot promotions. 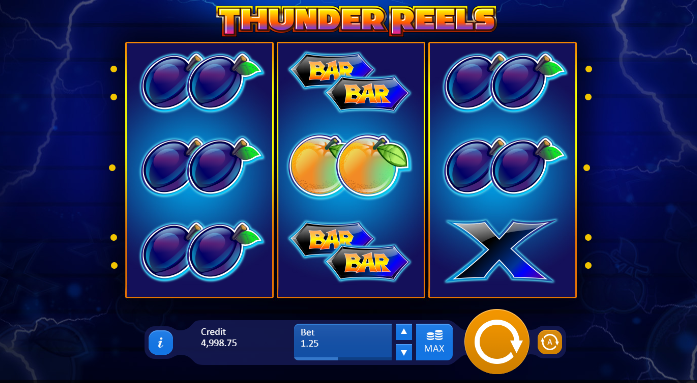 Thunder Reel is 3-reel 5 payline slot game inspired by 80’s video games and features traditional slot symbols such as fruit and bars. One by one the symbols include a variety of fruits such as oranges, cherries, lemons, blackberries, a dyad of gold stars, some bar symbols and a pair of 7 symbols. The setting of the game takes place at night with lighting bolts crashing down on the side of the reels with the title of the game appearing at the top with fruit to the left and right of it with the controls along the bottom of the screen. Auto play is also available which allows you to select your stake and number of times you wish to play for and the game will play automatically. Before you start the game you must choose how much you wish to bet and how many lines you want to play for anywhere between 1 to 5. The betting amount and coin size can be selected by pressing the up and down arrow until you have your desired amount. Once you have selected how much you want to bet, how many lines your playing for and your coin size you are good to go. Like most slot games out there the 7 is the high player in the game. If you get 3 of these you’ll be rewarded 750 credits, the second highest are 3 gold stars which will win you 200 credits, and the third highest are 3 bars which you will receive 60 credits for. The lowest paying symbols are the the X’s and the fruit symbols. The X’s will pay out 5 credits for 3 X’s and 40 credits for any 3 fruit symbols. If the full grid gets flooded with a single symbol at any point it will double your winnings. If you hit 9 7 symbols your overall credits will go from 750 to 1,500 which is pretty amazing. Winning combination can be made either horizontally or diagonally. Despite the visuals being pretty standard the game doesn’t hold back on being fun and is sure to keep you entertained for a while, and the rewards sure make up for it as well as they are pretty impressive. If you like old classic slot games with no complications but all the fun of winning, then Thunder Reels is the perfect game for you. RTP 96%. Another awesome game is Sugar Train slot.